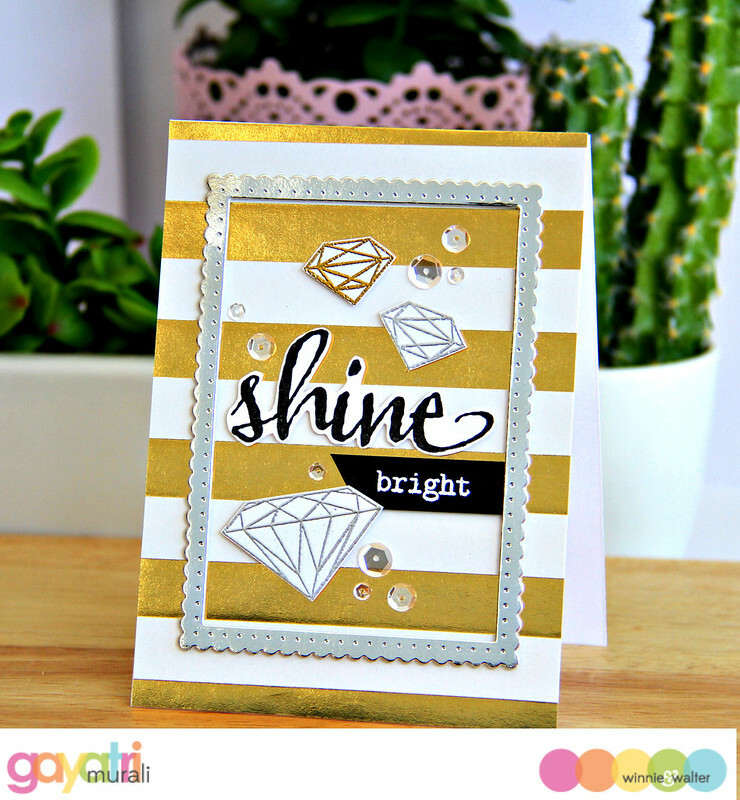 I have a shiny card to share with you first up today. Yes I have another post coming up soon. But first this card I made for Winnie & Walter’s Rerun post. This is a feature at Winnie & Walter blog every first of the month. We revisit one stamp sets and make a card to share. Today we are revisiting The Big, the Bold and Fun stamp set. This stamp set will be on sale for this entire month. Here is my card using this stamp set. I used a gold striped pattern paper for the background. Then I used the Essentials: Audrey Cutaway to die cut a frame using silver cardstock and adhered using foam adhesives. The gold and silver heat embossed diamonds are from My Precious stamp set. 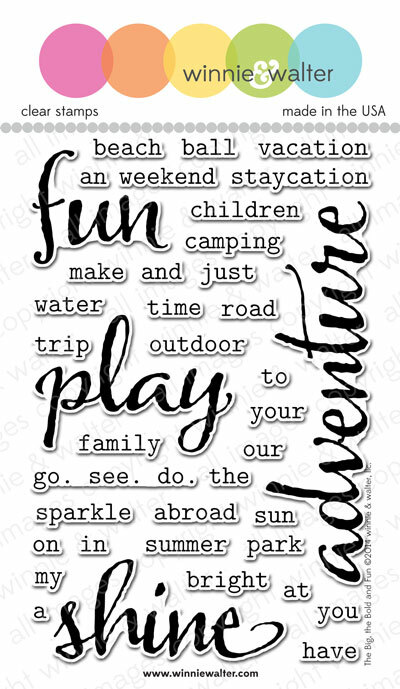 The sentiment from The Big, the Bold and Fun stamp set is perfect to add. 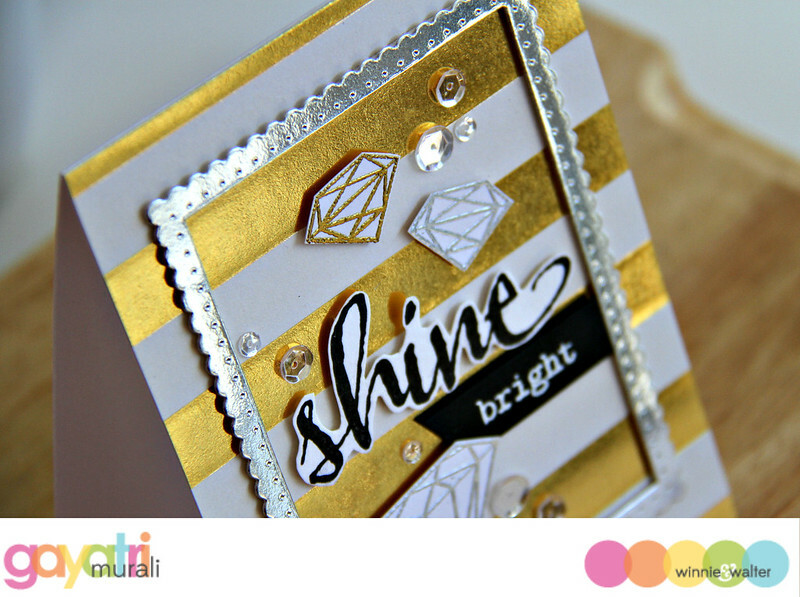 I simply stamped the big sentiment “Shine” cut it out by hand and glued using foam adhesives. The smaller sentiment is white heat embossed on black cardstock, trimmed and glued using foam again. All it now needs is Sparkly Clear sequins from Pretty Pink Posh. You can see the dimension on this closeup photo. Check out Winnie & Walter blog for more inspiration from Shay, Julie and other design team members. Thanks for stopping by my blog. I will see you soon with another post.